You too can experience the thrills of dressing as Gothams finest female crime fighter by wearing our fantastic Bat Girl fancy dress costume. This chic Batgirl fancy dress costume includes everything perfect for transforming yourself into Batgirl and consists of a flattering Black PVC look dress with stylish jagged hem line, attached black cape and yellow Batgirl Bat logo across the chest, matching black glovelets, yellow vinyl utility belt with debossed Batgirl bat logo to the buckle, black vinyl mask, and black boot toppers. 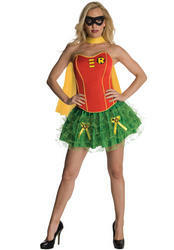 The bad guys better beware because you'll be out keeping Gotham City safe in style!